UUMAN is participating in the Wake Now Our Vision (WNOV) Collaborative Campaign Legacy Challenge from the Unitarian Universalist Association (UUA). Thanks to a generous grant from the UU Congregation at Shelter Rock, new legacy gift intentions that support UU congregations or WNOV partner institutions are eligible for 10% matching cash gift, up to $10,000. Gifts are first come, first serve and will be paid in 2019 and 2020. 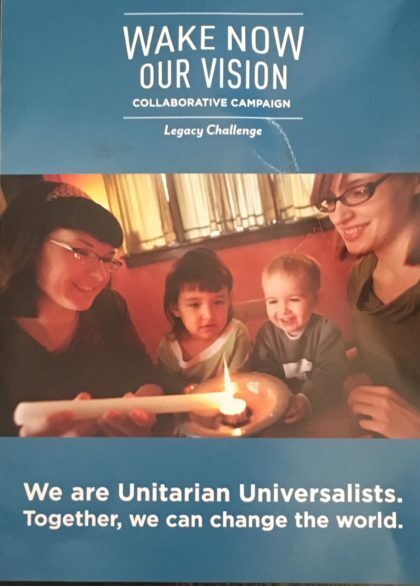 This is a perfect way to grow our UUMAN Legacy Fund in the near term and provide the opportunity to help broader UU movement become stronger, more effective institutions and congregations. You can read more about this program and download the simple application form at http://www.wakenowourvision.org. Thank you Shelter Rock and UUA for an amazing opportunity to build our Legacy Fund quickly! If you are making a legacy gift, don’t wait to apply for these easy matching dollars.